Chronicle-- Hopes are high among political parties who are sure of capturing all the 28 parliamentary seats in the Eastern Region, come December 7. In a chat with the executives of the New Patriotic Party (NPP) and the National Democratic Congress (NDC), they all expressed optimism that they would sweep all the 28 parliamentary seats in the region. The Eastern Regional Secretary of the NDC, Mr. Anthony Gyampoe, in an interview said, chances were far brighter for the NDC in the region this year as compared to the 2000 election. According to him, unfortunately, the government of the NPP had woefully failed to satisfy the people's aspirations. Mr. Gyampoe noted that governments were voted into power to make life better for the citizenry and if by a four- year term the people were worse off than before, then they owed it as a duty to vote the non-performing NPP out of power. 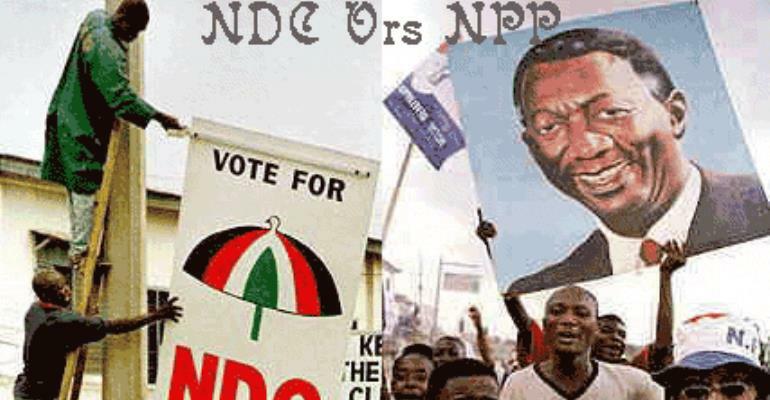 The NDC Regional Secretary pointed out that, his party was seriously campaigning on the grounds, reminding people of the good works that the NDC had left as legacy for the nation. Mr. Anthony Gyampoe observed that the response that their call on electorates to return the NDC back to power was overwhelming and cautioned the party's followers to remain focused on issues and not personalities, adding that the supporters should stand firm and be tolerant in the face of provocation from their detractors (NPP). The Eastern Regional Chairman of the NPP, Nana Kofi Adi Ankamah said, with the calm political atmosphere in the region, he highly believed that the NPP would sweep all 28 seats in the region. “With this atmosphere, coupled with the good works, which the NPP government has done in the region, we in the NPP are sure of sweeping the whole 28 seats in the region,” he asserted. Nana Kofi Adi Ankamah claimed the NPP government had fully delivered on all the promises it had made to Ghanaians, before taking over power, under three and half years. He said, a lot of NDC activists who made pronouncements of harsh economic life, were those who had been receiving free money as ghosts in their administrations, which was not forth cominga anymore due to the deletion of their names from pay rolls and fictitious contracts. These are the people who are crying that there is no money in their pockets. Further more, all hard working people who genuinely work to earn a living, got their average share of the situation in the country, he claimed. According to him, it was only people of Ghana and those who would raise their heads that could see the developments brought about by the NPP. The NPP regional chairman stated that, whatever lies the NDC was propagating, Ghanaians were waiting for December 7 to use their thumbs and it was there that they would know their fate. Mr. Kwame Antwi, the Convention Peoples Party (CPP) regional secretary pointed out that Ghanaians were fed up with governments, which had failed in addressing their problems. With this, he urged all to vote the CPP to power to carry out with the good works Osagyefo Dr. Kwame Nkrumah had initiated for peace and development.